As a parent, I know how important it is for my own preteen and teenager to read. Fortunately, I love reading, and I have a library of books at my house, in my classroom, and hundreds of students (through the years) who have advised me on what books they like to read, and which ones are the best. Unless you’re an English teacher, you probably don’t have access to that kind of boots-on-the-ground information. 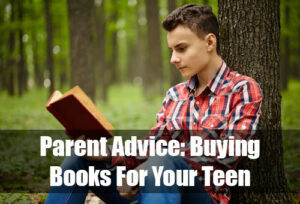 However, there are some steps you can take to find books that your teenager will enjoy. Ask your teens what books they have read before that they enjoyed. I’m sure you’ve already done this. Some teens will rattle off a list of books, and others will recall that one book they read back in kindergarten. But this is definitely worth a shot. By asking my daughter this question, I realized that she loves reading fantasy novels like Harry Potter by J.K. Rowling or Cinder by Marissa Meyer. By talking to my teen-aged son, I discovered his love for the Michael Vey series by Richard Paul Evans. Ask your teen to fill out a reader interest survey. I know, that sounds silly. You have lived with this young person for more than a decade, and you know him or her better than anyone. But sometimes, as parents, we’re too close to see how all of those wonderful and unique traits can translate into a reading interest. Search for books on GoodReads. GoodReads.com is essentially a user-generated database of books, annotations, and reviews that you can search easily. The site also allows you to setup an account and create your own shelves of books that you have read or want to read. It’s actually more complex than that, but for your purposes, you can encourage your teenager to setup an account and start tracking their own reading. Either of you can use it to find books by genre, author, and topic. Additionally, you can follow other readers, whether they’re people you know, or just people who have similar reading interests. It’s an amazing way to find even more books to read. You can start by following me, if you’d like. Librarians are founts of reading wisdom. Tell a librarian your interests, and they can tell you what books are in the library that you may like. Even better, when you find that book, you can read it at no charge — provided you return it on time. You can take your teen to the community library, or your teenager can go to the library at your school. The school librarian in particular will have the most knowledge about books of interest to teen readers. Encourage your teen to research books on Amazon. One of my favorite places to look for books for my kids is on Amazon. Not only can I easily do a search by author, title, or topic, but once I find one, I can ask them to sit down and read the book description, the reviews, and (Here’s the best part!) the Look Inside feature. On many books, you can click the Look Inside link and read the first few, and other select, pages. This is a great way to find out if the book is of interest to your teen before you buy it. You can also read the reviews on Amazon, as they will often help pique interest in a book. I love going to the bookstore, ordering a frappuccino, and perusing the aisles for an hour or two. Whether your teen loves to read, or not, this can be a great way to find new books to read. I recommend you encourage your teen to find sections that look interesting (sports, mystery) and then pick up several books and read bits of them to find ones that connect.